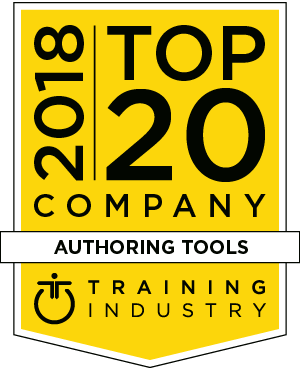 Training Industry continuously monitors the training marketplace looking for the best providers of authoring tools. This seventh annual list is designed to help buy-side organizations in their searches for the right training partners. The Game Agency are game developers who create games for K-12 and Fortune 500 clients to complement their educational and training initiatives and to increase engagement and retention while providing tons of actionable data to measure the effectiveness of their campaigns. Elucidat’s authoring platform helps ambitious teams to create and manage successful elearning at scale. Providing leading training providers and global organizations with award winning technology and unparalleled support, Elucidat has reached over 3 million learners. CD2 is a client-focused organization with a goal of providing clients with truly innovative technology and their users with a more compelling learning experience. To do this, we constantly create new capabilities to meet the needs of our clients and the industry. Adobe Captivate has been the pioneer and industry leader in providing the best workflow for creating responsive e-learning courses. With Captivate 2017 the workflow is made simpler and more intuitive. Fluid Boxes automatically rearranges and resizes the content to fit the screen dimension. iSpring Solutions is an international software company that provides professional e-learning authoring tools used by over 13,000 companies and 1,500 educational institutions. iSpring is committed to developing high-quality desktop and web-based solutions for e-learning. iSpring is recognized for its well-engineered products and exceptional support. Talentsoft Learning is a key figure in software and services dedicated to blended learning training (on-site and distance training). Support is provided to businesses from all industries by enhancing their skills and human capital. Global organizations choose the gomo learning suite for the creation and delivery of their mission critical e-learning projects. gomo provides the world’s leading responsive HTML5 e-learning authoring, hosting and analytics suite. "gomo is a product that embodies the functionality and capability needed by today's modern learning organization." Since 2004, Growth Engineering – learner engagement superheroes – have been fighting against dull online learning. We create user-focused learning technology solutions that are proven to change behaviors. Our game-based content authoring tool, Genie, has helped achieve some great results for some of the world’s biggest organizations. With more than 12 million users, CrossKnowledge is an engaging, forward-looking digital learning solution, driving business outcomes and the ability to transform individuals and entire organizations. We provide a customized, fully integrated learning solution and implement it at unmatched velocity. MOS Chorus LCMS and MOS Solo authoring tools enable the creation of RAID (rapid agile instructional design) online and in collaborative mode. MOS Chorus LMS enables “Haute Couture” portals (full customization of learners’ environment). MyEcontentFactory by Gutenberg Technologies empowers your e-learning, blended learning or digital publishing strategy to rapidly produce and distribute your web and mobile educational applications at scale. Intrepid by VitalSource is a new force in corporate learning with two learning technology platforms, Intrepid Learn and Intrepid Discover, both of which offer corporate learning authoring options. Both are learner-centric, intuitive and move the needle for organizations solving their most critical business challenges. We believe that thanks to new technologies, education can be egalitarian and easily accessible. With the results of our vision, and because of the quality of our technologies, there are more than 30 companies from all over the world that use mAuthor, and thousands of pupils who can learn in a safe, engaging and fully interactive way. Lectora by Trivantis is a leading e-learning authoring software with Responsive Course Design for easy mobile-friendly development. Responsive Course Design provides a timesaving “design once, publish to all devices” approach to creating content for all devices. Xyleme is the learning content management platform of choice for the visionaries who understand that learning content is an asset and are looking for innovative ways to change the way learning is created and delivered. Our platform is for companies that have complex content, helping them author, publish and deliver learning content efficiently. eXact learning solutions is a leading, business solution provider in the field of digital learning content management. Its content lifecycle care solutions include collaborative content creation, structured and workflow-based content management, and multiple output delivery of content in any desired format.